From my terrible memory and a few photos that I have, we gathered together as a family after Christmas. It was nice to have another Christmas after we had already celebrated. It was fun to have Alex and Anna and Ryan and Becca and their family here visiting. It is always fun to have everyone around. The kids always have so much fun! We all get together and Quenalee always does such a good job putting Christmas together for all of us with thoughtful gifts for everyone! My favorite were the SNUGGIES that the boyz got. It was fun one night...she usually does the "greedy game" where we all fight over some really fun or funny gifts as a game-but instead this year, she gave us each an envelope with a photo and some money. The photo was a picture of a child who was an orphan. Andy has a really good friend who has gone to volunteer at this orphanage and she sent Quenalee all of the photos. There was a description of the child and their talents and personalities. 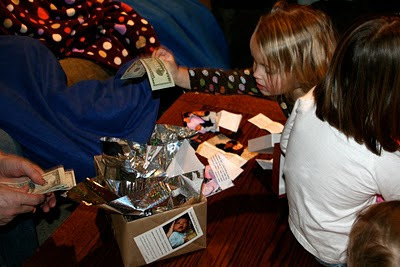 We could choose whether we wanted to keep the money or to give it away to the orphanage. It was neat to hear about it and to watch all of the family give their money. The kids were cute about it too. It was nice to do something that was giving back. What a special idea. After we had that night, we had a riveting arm wrestling match and leg wrestling match which both Calli and Mack got into. It was hard not to when they have a very competitive aunt Anna who got into it much more than they did.